1. NOT SEEKING REIMBURSEMENT FOR MILEAGE AT $.54 PER MILE- Yes, the insurance company is supposed to pay you for your mileage to and from all medical appointments required because of your work injury. They may or may not have told you this, but it is the law. Also, if you miss time at work to attend doctors' appointment you are supposed to be paid for your time also. 2. ACCEPTING WHAT THE INSURANCE COMPANY PAYS YOU WITHOUT LEARNING THE LAW- Often times the insurance company will pay you money consisting of your impairment rating only. The insurance company should pay you your impairment rating without requiring you to sign settlement documents. If you have an injury to an unscheduled member (such as an injury to your back, shoulder, neck, brain, etc.) then the impairment rating may only be a small portion of what you are owed. Further, you may be entitled to additional benefits under the 2nd Injury Fund . . . .
3. FAILING TO OBTAIN YOUR IME- INDEPENDENT MEDICAL EXAMINATION WITH A QUALIFIED DOCTOR- During your course of treatment, the insurance adjustor may set-up an IME with a doctor that they choose. Chances are that they will be sending you to their IME doctor whose opinion the insurance company likes. Depending upon the facts in your case, you may or may not want to attend their IME appointment. Keep in mind, that under Iowa Code Section 85.39, you have the right to have your own IME with a doctor that you choose once their doctors place you at MMI- maximum medical improvement and evaluate your impairment rating. Most of the costs of your IME are to be paid by the insurance company. Keep in mind that you do not want your IME to be with just any doctor. There are a handful of good IME doctors throughout the state that we can help you get in contact with. 4. NOT FOLLOWING UP WITH MEDICAL CARE- If you fail to see your doctors on a regular basis, this can be considered evidence that you are no long having problems and perhaps made a full recovery. While you should not go be going to the doctor every day, if your doctor tells you to "follow-up as necessary" this means that you should contact your doctor in a few weeks if your problems are not getting better. If you fail to follow-up regularly then you may cost yourself thousands of dollars in your workers' compensation case. 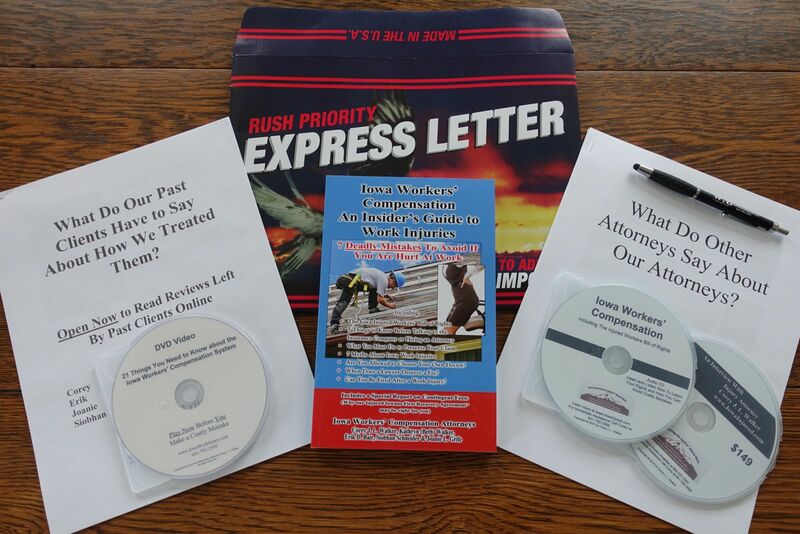 To learn the other Deadly Mistakes and how to avoid them, along with the Iowa Injured Workers Bill of Rights and much more, REQUEST YOUR BOOK NOW!! For Immediate Attention or to schedule your NO COST Iowa Work Injury Case Evaluation, CALL 641-792-3595 and ask to speak with Corey or Erik. What Do Other Iowans Say About Our Book? Our attorneys have seen many injured Iowans hurt at work make mistakes before they had the information to protect their rights. We offer a book at No Cost to protect injured workers from making the same mistakes. Most attorneys require you to make an appointment in order to get some of the information that we provide to you in our Iowa Work Injury book. Our Guarantee to You: We are so confident that our book will help educate you that if you have been hurt at work and do not learn at least one thing, let us know and we will donate $1,000 to your charity of choice.